This project was one of my first and favorites. 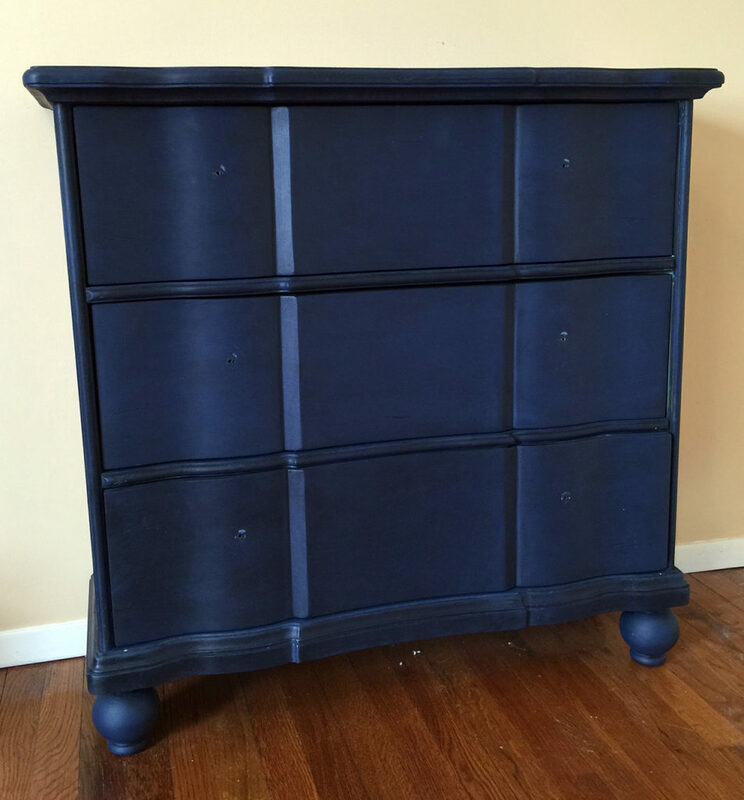 I owned a small dresser that I could use, but it was the wrong color. Fortunately an Annie Sloan stockist, Suite Pieces in Huntington, NY, wasn’t far away. Before perusing the paint samples, a display of knobs caught my eye. One set called out to me and I knew they were “it.” Only a select few understand the strange and mysterious summons of furniture hardware. 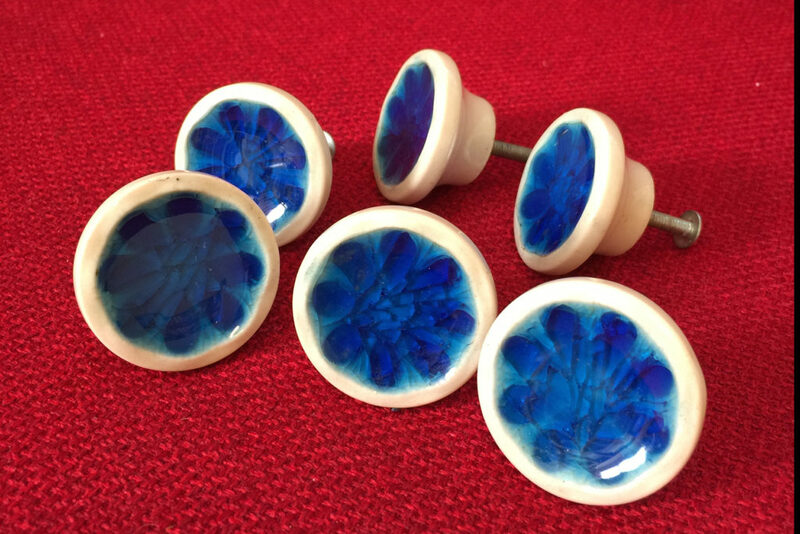 The blue and white knobs made picking the paint color easy. Annie Sloan Napoleonic Blue. At this point, I had little experience with chalk paint and wax and I didn’t want to get too fancy. I removed the old knobs, kept them together in a baggie and added them to my box of knobs. This was a good sign that I could possibly stay organized. 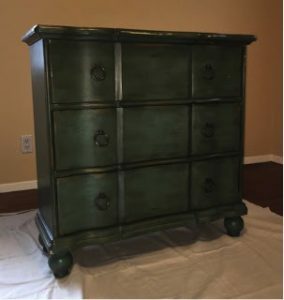 I found a dresser in this color and a doable technique on Pinterest and felt no shame as I tried to copy it… in my own style of course. I covered the boring green with two coats of Napoleonic Blue. This is a color named for a man who wanted to conquer the world and failed. I wanted to conquer a dresser. Sometimes you have to ignore an omen. I applied clear wax and gave it a day to dry. Then one coat of dark wax and a good buffing. The inside of the drawers aren’t painted but I plan on Old Ochre for some contrast. Beautiful! But my dresser didn’t come to life until I added those knobs. It don’t mean a thing if you ain’t got that bling! Let’s call it a literary project because I put books on top. Credit to my creative husband for the photo of our house over the dresser. Imitation is the sincerest form of inspiration. P.S. I spotted the same green dresser on an episode of Ray Donovan. You know you’re hooked when you’re watching a high-tension action flick and looking at the furniture. 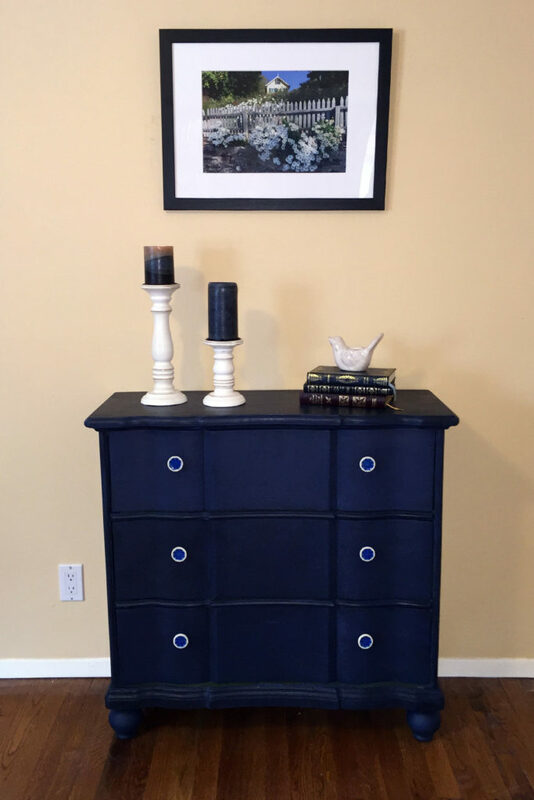 This entry was posted in Furniture, Musings and tagged Annie Sloan, chalk paint, craft, crafting, furniture, Karen Rae Levine, Napoleonic Blue, paint, painting, refinish, refinishing, refurbish, refurbishing, repurpose, repurposing, stain staining, Suite Pieces on October 21, 2016 by Karen Levine.